In a previous article, the acronym SHIFT™ was introduced to summarize the five key strategies you must put in place to move your firm from compliance to advisory services. 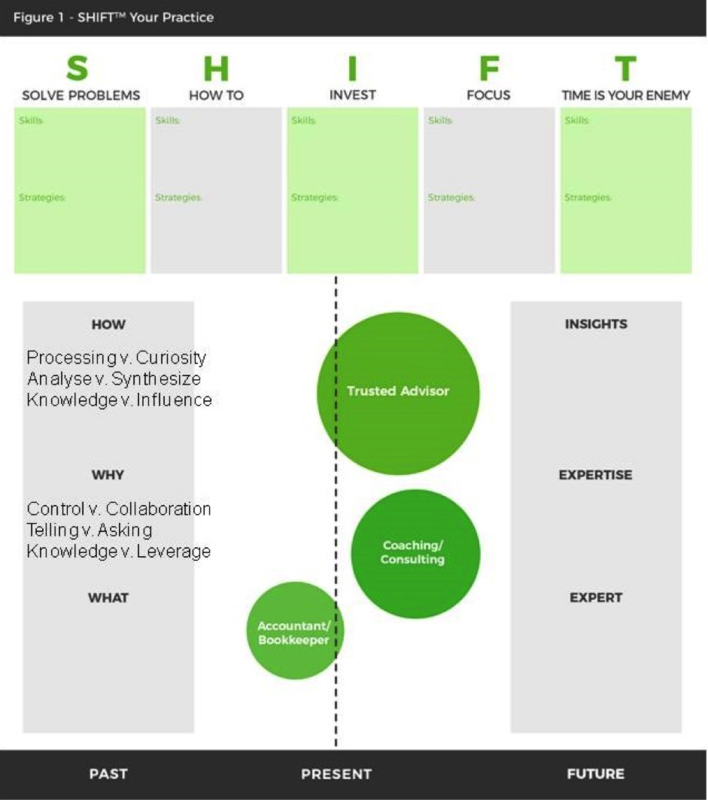 Similarly, SHIFT™ can also be used to explore in depth the soft skills, focus and mindset you must master in order to successfully execute the shift to advisory. Perhaps not surprisingly, practitioners who have victoriously made the shift to trusted advisor rarely attribute their success to apps, tools of the trade or technology. Rather, they all point to the same key attributes, skills and mindset needed to execute the transition away from compliance. The decision to expand your offering to include advisory services is just the first of many steps in your journey. In most cases, it will take years to develop the soft skills, clarity and agility. And, as you are about to discover, this journey you are embarking on brings with it a challenging minefield of continuous setback and improvement. Where in the past, you may have become accustomed to seeing your career progress upward in a linear or chronological fashion, this new endeavour is circuitous and unpredictable. To a large extent, your abilities and skills will be forged and formed by the many challenges and setbacks that you experience while shifting your practice away from compliance. This first step towards solving problems is crucial, as it sets the tone for the relationship you are developing with each of your clients. You can no longer hide or take refuge in the domain of "WHAT," which has afforded you a certain level of "perceived" comfort. Once you make the deliberate choice to solve problems, you have no option but to embrace some uncomfortable new skills, perspectives and thought processes. This shift toward WHY and HOW is fundamental and profound. Make no mistake, there is a fundamental difference between the mindset of an accountant/bookkeeper and that of a business owner. A business owner is concerned with growth and expansion, not just refining what exists financially today. To make the shift successfully, you must be able to identify, quantify and cure pain across financial, strategic and personal aspects of the business. To do this properly, you must align yourself with the perspective of each client and what matters most to them so you can collaborate, instead of trying to control the relationship. This will require an ongoing investment of time with them each month. And, perhaps most terrifying of all, you are going to need to get a whole lot better at making quick decisions and taking action, as you will need to influence and empower your clients to step up as leaders within their own organization. Advisory is not a "product;" it’s a complete overhaul in the way that you communicate with your clients, develop the relationship, influence them to take action and manage mindsets/expectations. Your clients are no longer engaging you for the software you use, beautiful dashboards, methodologies or even specific services. They are investing in your advice, insight and the ability to achieve a measurable, positive impact on their business. This distinction is fundamental because you a no longer selling a finite product, such as set of financials or a cash flow forecast, and the value of your expertise and insights cannot be measured in increments of time. In the domains of WHY and HOW, nothing is certain and there are likely to be multiple "acceptable" ways to achieve success. You can no longer continue to fish for your clients – you need to teach them to do it for themselves. This will pose a significant challenge for many accountants and bookkeepers, as you have been trained and promoted based on your ability to complete tasks with 100 percent accuracy. Now, to move your client forward, you must to let go of your undeniable desire to be right and for there to be one best way (i.e., your way) to do everything. Letting go of the mindset that has brought you to where you are as an accountant or bookkeeper is no easy feat. Your current mindset is deeply ingrained and is tied to your core beliefs and values. Both science and psychology have proven that it will take time and concerted effort to change them. With compliance, you were in complete control over how you went about doing your job to produce an output. Advisory is a completely different beast – meaning you must shift to the opposite end of the spectrum, relinquish control, and collaborate with your client to influence and empower them to move toward their goals. This means you can’t sit back and simply tell them what the problems are. In order to lead them to the solution, you will be doing less talking and a whole lot more listening (and asking questions). You will discover that questions ARE, in fact, the answers. Brilliant questioning skills will reveal what is behind the financials and the motivations that are driving their behaviours. In many ways, it comes down to intellectual curiosity and flexibility. Your new role is to assist your client to construct and clearly see for themselves the overall picture that is emerging about their business and its potential. Rather than just analyzing the business, you will help them synthesize different ideas, vision, influences or factors, and direct them towards a new, better future. Make no mistake, this shift is going to test your patience to the limit because you are going to have to suppress the urge to step in and fix things for your client. This is a hard habit to break. In the new realms of WHY and HOW, technical, financial knowledge is actually a very small piece of the puzzle. Your success will be tied to your ability to influence and persuade. Some of you may mistakenly equate this with needing to acquire "selling skills" in order to become an advisor. The truth, however, is that leverage and influence are far more powerful, essential and universal skills. Ironically, your success is less tied to your ability to market and sell, and more towards your ability to gain leverage on your clients so you can influence them to take action and move forward. In this new role, you are really selling ideas, insights and impact, not a 3-tier pricing plan of your advisory wares. In the realm of WHY and HOW, you must move from being precisely accurate and towards being directionally correct. Compliance necessitates a high degree of accuracy. Advisory, on the other hand, involves the management of risk and uncertainty. That is essentially why it’s more important to be directionally correct, relevant and meaningful. The future, by definition, is uncertain and the possibilities for what might unfold are constantly changing. In order to deliver insights and advice that are valuable and significant, your recommendations must be more flexible and agile. You need to get better at rolling with the punches (the inevitable ups and downs). In compliance, for instance, you have placed a great degree of emphasis on cash flow forecasting. In the realms of WHY and HOW, forecasting is far less important. What the client wants and will pay you for is tangible strategies and tactics needed to help them move from where they are to where they’d like to be, and navigate the inevitable speed bumps along the road. Your ability to roll with the setbacks, react to challenges, anticipate changes and help your client to pivot (if necessary) is now much more valuable and influential. To stand out in a sea of wannabe advisors, you must focus on strategy, implementation, feedback and adaptation. The more detail that you put into your forecast, advice or service, the more likely you are to be wrong and unhelpful in the realm of advisory. At first, this may sound counterintuitive, especially to those of you who are obsessed with accuracy and balancing. Remember, those skills are drilled into you both in school and on the job. Advisory necessitates a 180° degree shift from back to front (i.e., from the past to the future) and the ability to empower your client to move forward and react quickly to trends, changes, opportunities and threats. 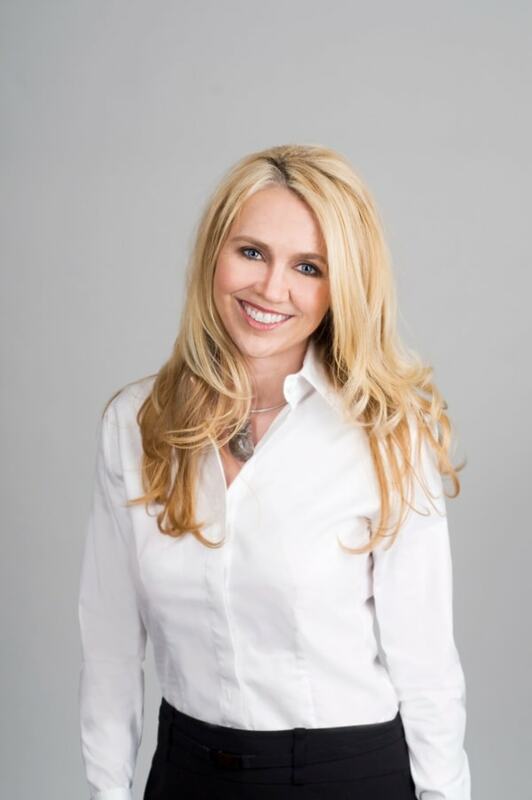 As a result, many of you will have already inadvertently made the mistake of placing far too great an emphasis on cash flow forecasting as an "advisory" offering. If you think about it, forecasting is just a compliance-based task. It is often billed as a time-based task, as opposed to being priced and delivered based on impact and value created. And, invariably, far too much time is wasted on the details (and variances – i.e, what-if analysis), leaving not enough time or resources to implement the strategies and systems to fix the problems or achieve the desired result. As you transition to advisory, your value will be tied to the impact you can create. Time spent is irrelevant. Forecasts are irrelevant. Your value (and the amount you can charge) will be proportionate to the insights and impact you can deliver based on your ever-expanding knowledge, skills, focus and mindset.